Sandgate (サンドゲート [sandgate] in Japanese) is an area in eastern Thanalan. 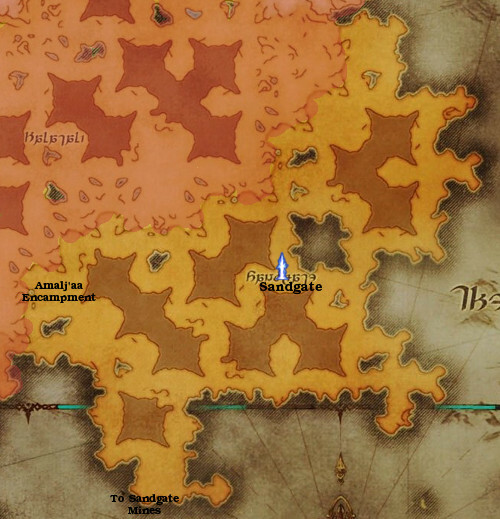 Wind regularly carries sand from the Sagolii Desert all the way here, which is how the area got its name1. To its north-east (2.0+)/north (1.x) lies Burning Wall, and to the north and west lies Drybone (2.0+) / Halatali (1.x). It could be speculated that the deep ravine that Calamity rent on the ground as well as the collapse of the cliffs of the Burning Wall sufficiently changed the face of the earth that it became more appropriate to now consider the very eastern parts of Sandgate as Burning Wall. As for Halatali, it was retconned to be a dungeon instead of an area. Southern parts of the 1.x Halatali area became part of Sandgate, and northern parts part of Drybone. To the east of Sandgate there is only the Grand Wake, and to the south is a road leading towards Broken Water. There is an Amalj'aa encampment in the area, and it proves to be the most distinguishing feature, as Sandgate is quite small in size. There is also a prayer stone dedicated to Azeyma on a cliff in the east portions of Sandgate. A cave leading to an active mine could be found in the south in pre-Calamity days. 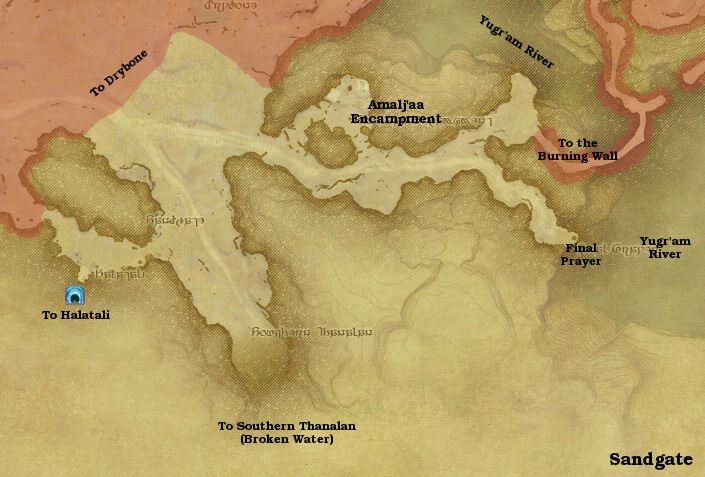 In version 2.0+ maps, it would be located to the south of the Amalj'aa encampment, in the interval between Sandgate and Broken Water. The Amalj'aa encampment (アマルジャ軍陣屋 [amalj'aa-gun jinya] or 'amalj'aa military encampment' in Japanese) is just what it says - an encampment of the warrior castes of Amalj'aa. From here they prey on unwary travelers of the Royal Allagan Sunway to the north. The Final Prayer (最後の祈祷 [saigo no kitou] or 'last prayer' in Japanese) is a prayer stone to Azeyma, popularized by the pilgrimage asked for by Louisoix Leveilleur in the days leading up to the Calamity. It is said2 that on the day of the Calamity, many who were still praying for Azeyma's protection here were burnt to death by the flames of Bahamut. 'Sandgate Mines' (real name unknown, this is simply what the players have come to call it) is one of the 1.x dungeons that was never actually added to the game. Only its entrance could be accessed in the game proper. Data mining has revealed that that inside, it was most likely an active mine. There were rails for mining carts all over the place, some on raised rails near the ceiling or otherwise high up, as well as metal pipes with valves. One of the most interesting rooms in the mine had a deep ravine running through it, with various tracks and pulleys all over it, and everywhere showed signs of active mining. It is unknown what happened to the mine in the Calamity, if it wasn't meant to be retconned out entirely. Note that there were no quests that started in Sandgate in version 1.x. Note that there were no gathering points in Sandgate in version 1.x.